The module has the capabilities of affiliate programs, customer referral programs and partner programs. Sponsor - These are the people that are recommending your products. 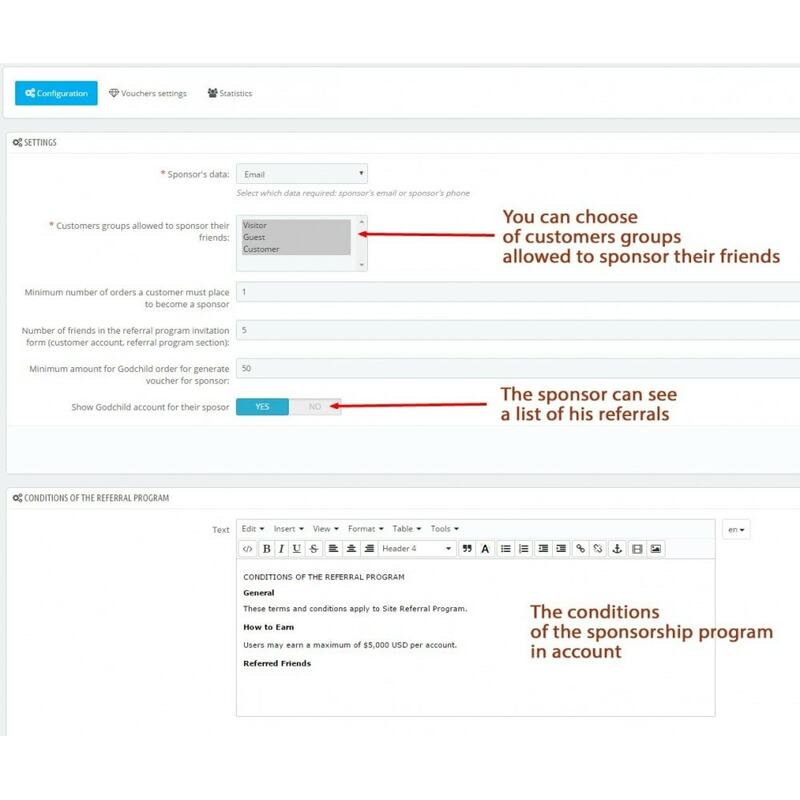 Referral (friend) - These are the new customers you are acquiring from your referral program. Get more customers with new Referral and Affiliation Program! 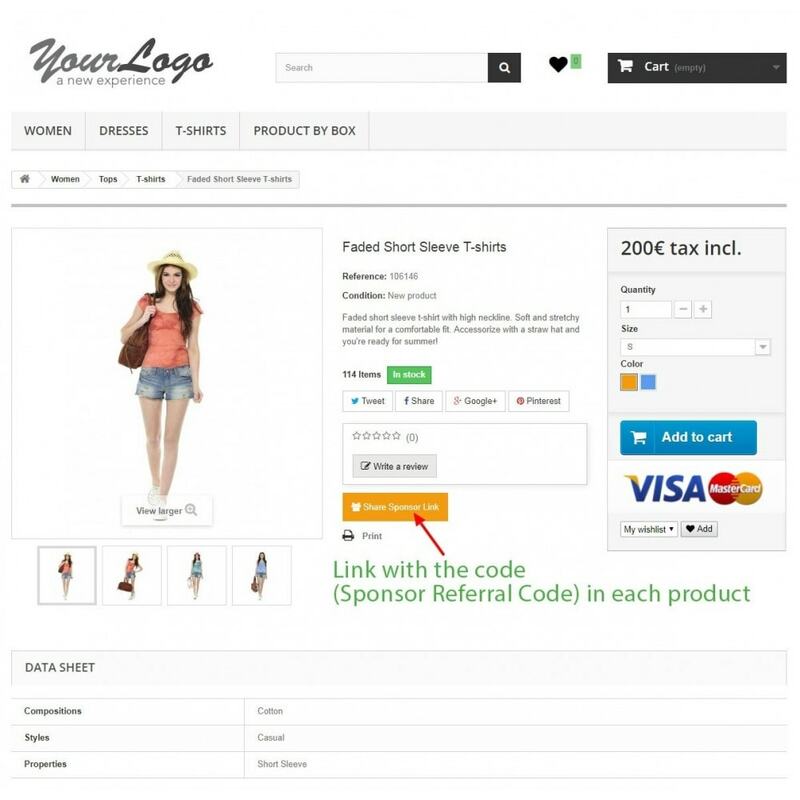 The module allows you to attract more customers to the store without increasing advertising costs, because sponsors advertise your store. 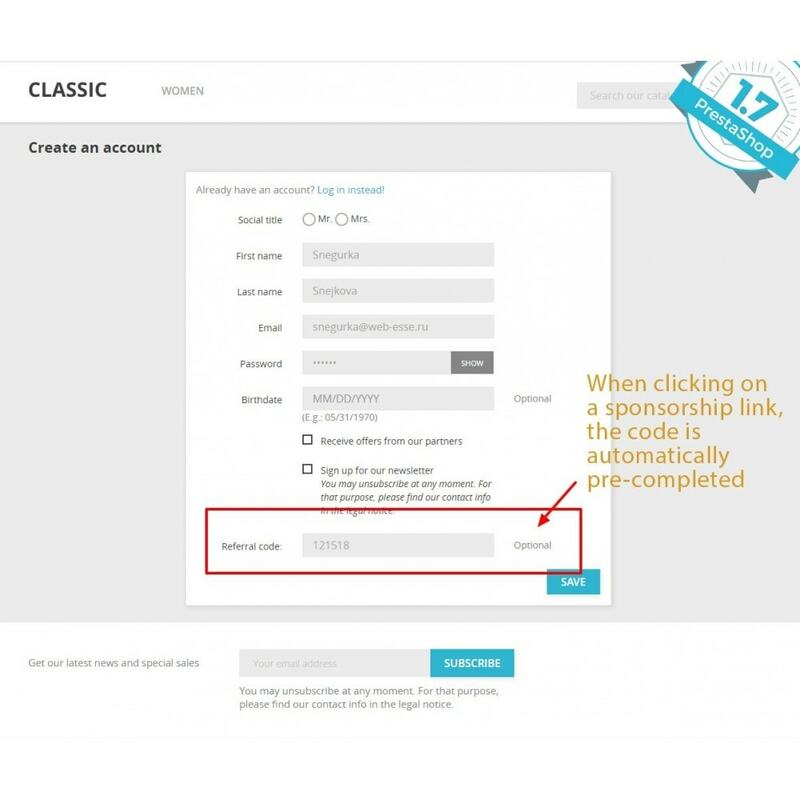 Form pre-completed registration, if the Referral was invited by email. 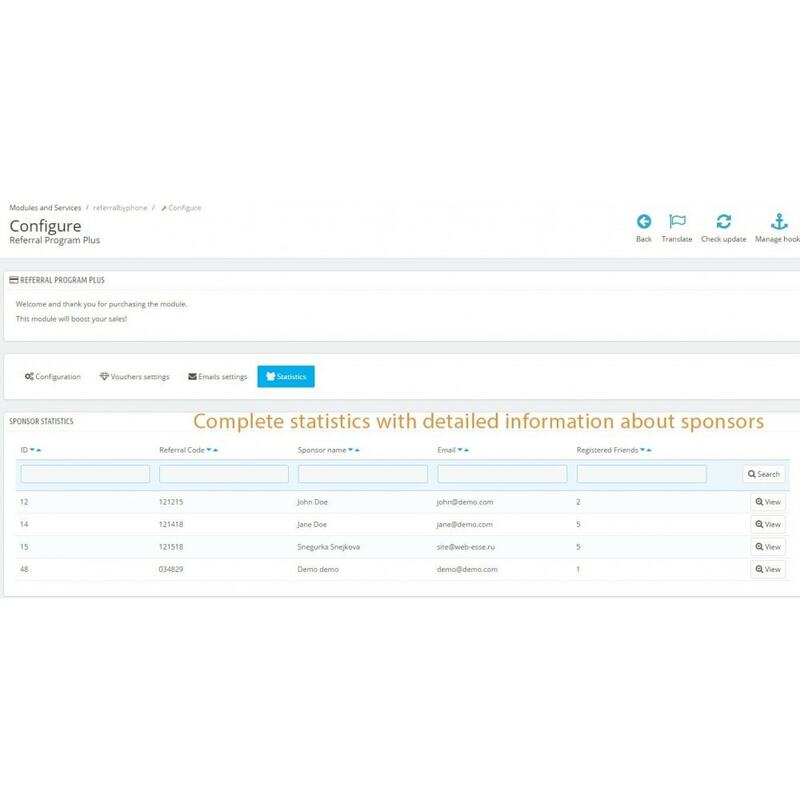 Complete statistics with detailed information about sponsors and their friends. 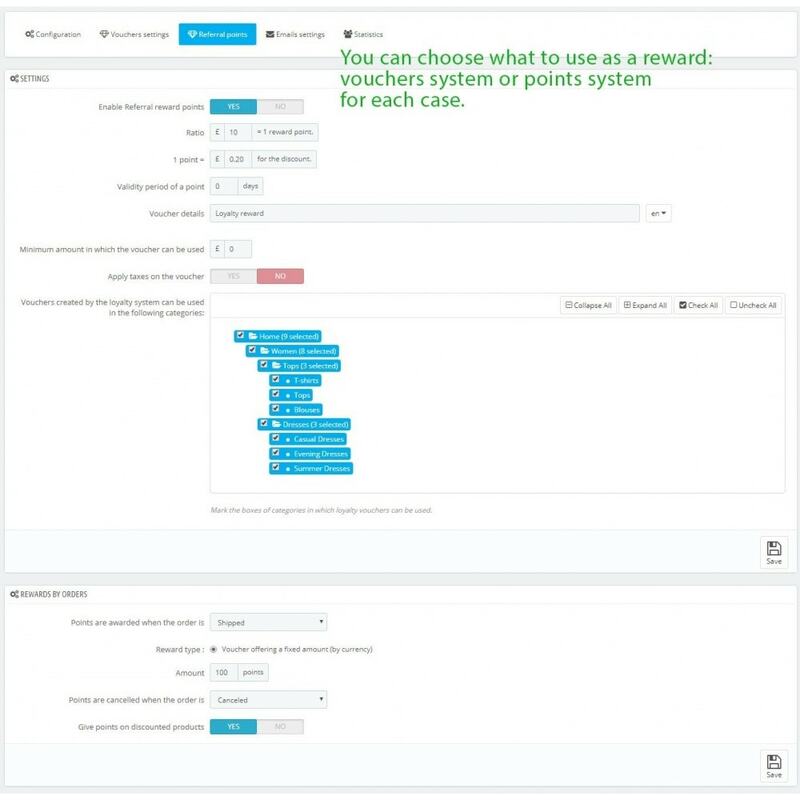 * You can choose what to use as a reward: vouchers system or points system for each case. You can use both rewards at the same time. 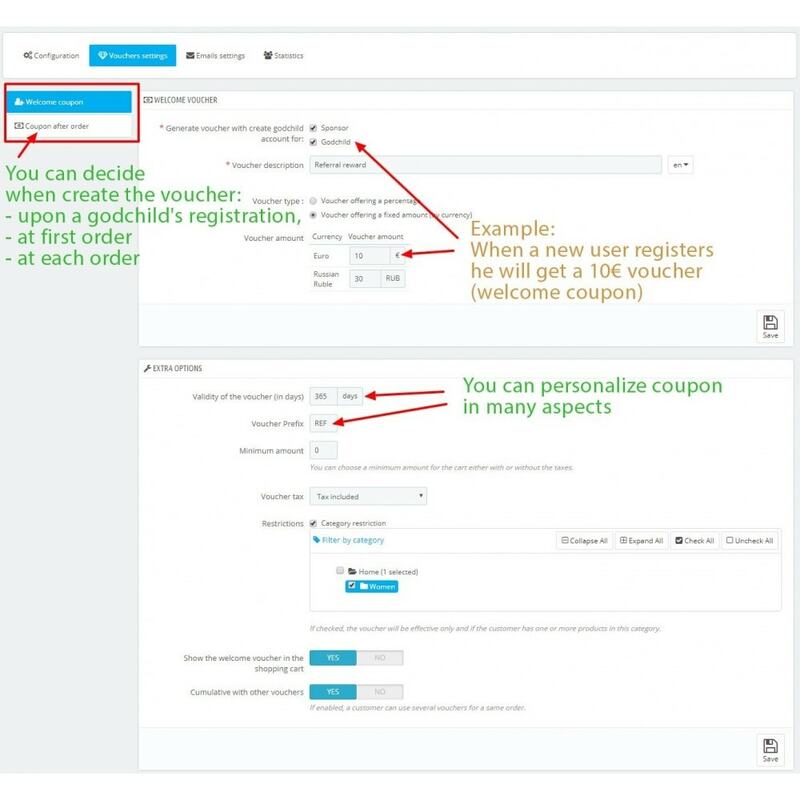 You can decide when create the voucher: upon a godchild's registration, at first order or at each order. 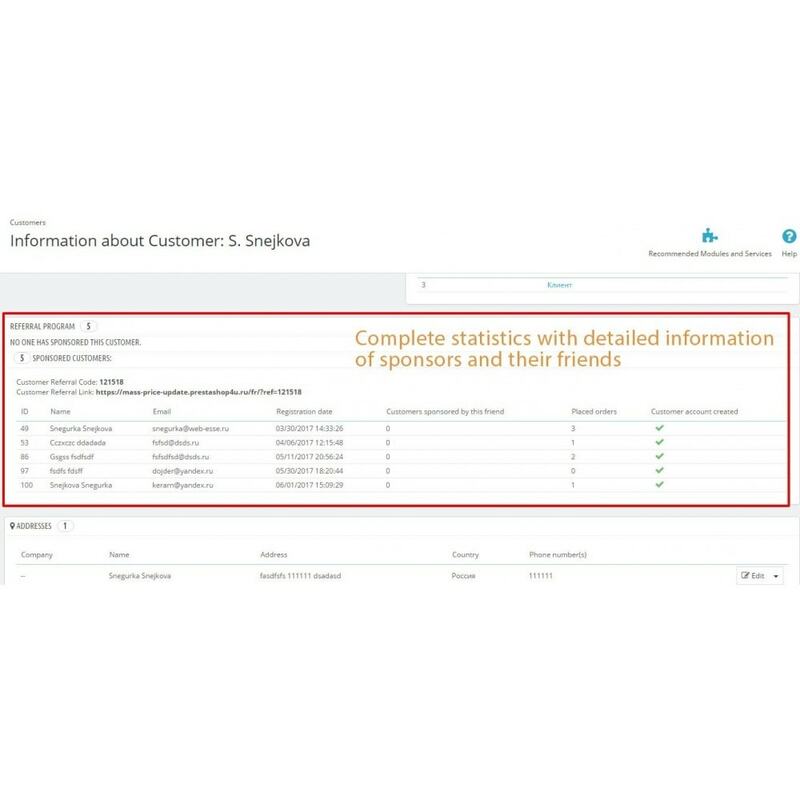 When an invited customer makes an order, his sponsor can receive a reward by points. These points can accumulate and at any time be converted into a coupon. The amount of the reward is displayed in the sponsor account. Sponsor can send an invitation email. The sponsor receives an e-mail after each new registration of the referral. 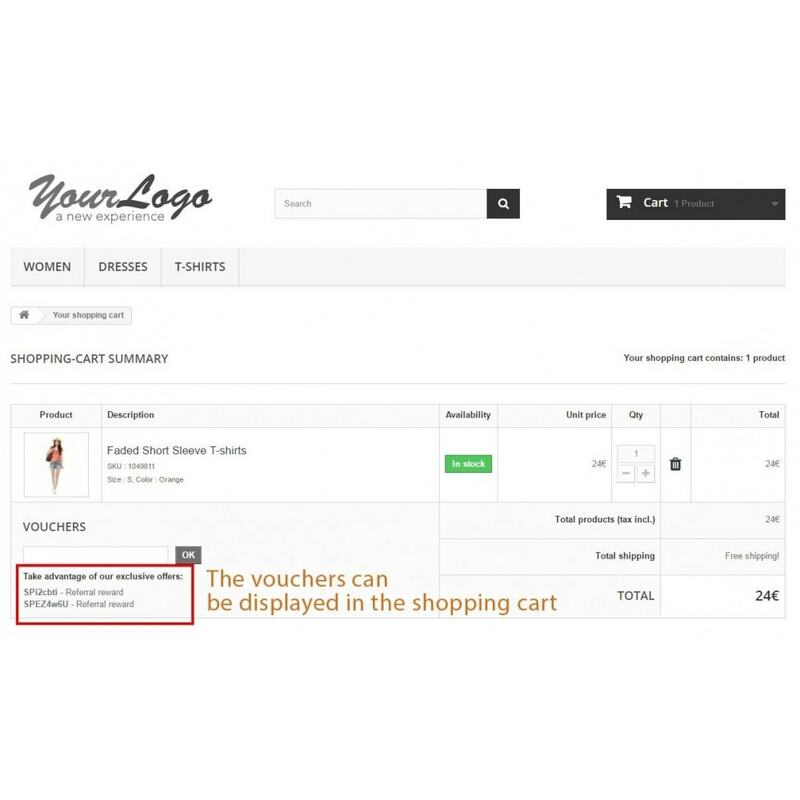 Customer and Sponsor can receive an email with voucher after friend’s new registration (welcome coupon). 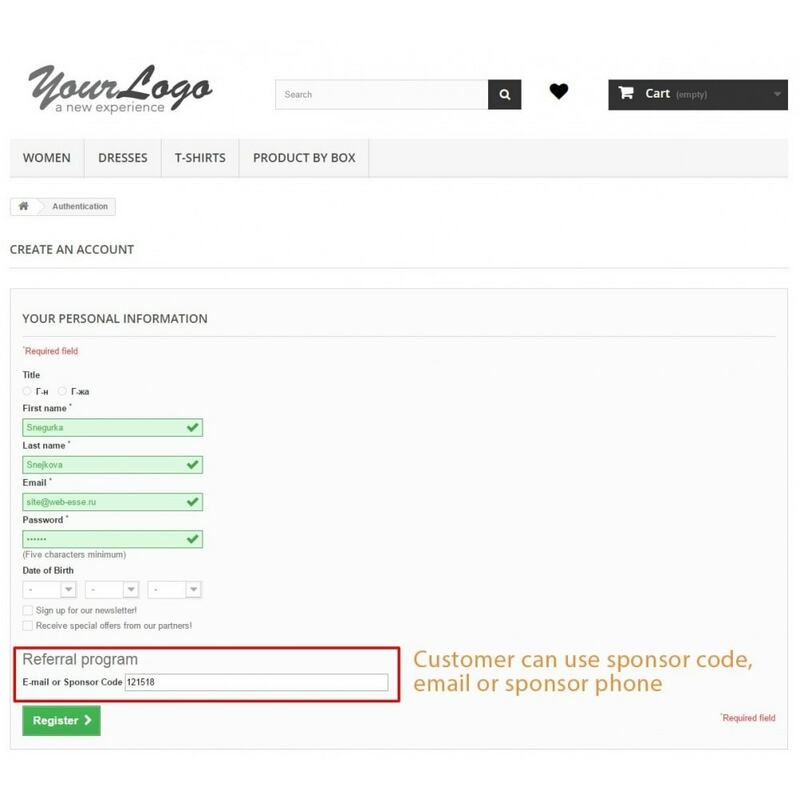 Customer and Sponsor can receive an emailafter friend’s order. 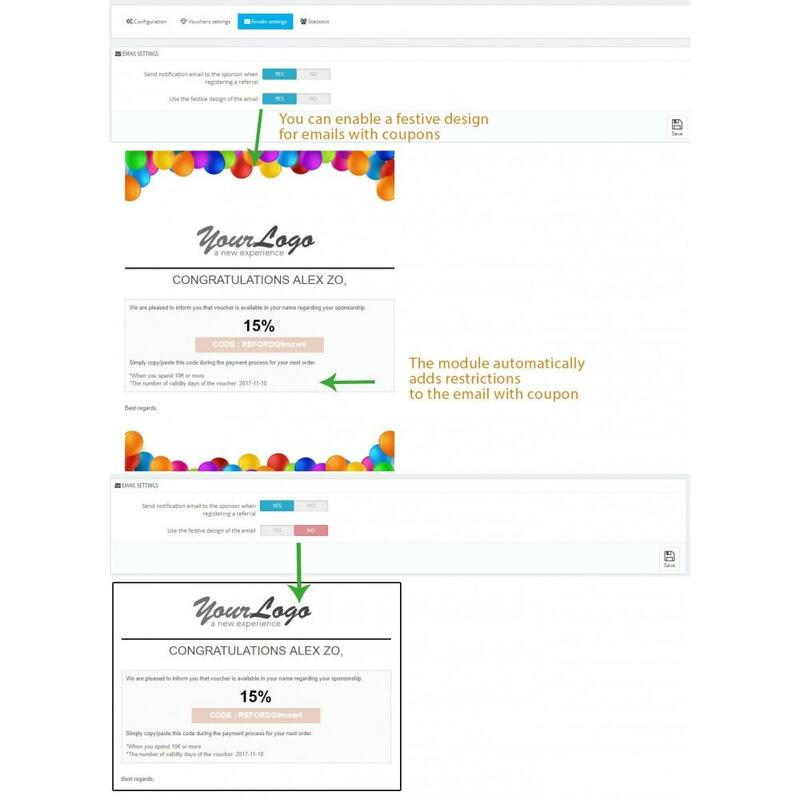 You can edit all emails through the convenient interface of the built-in editor Prestashop. The sponsor invites his friends to discover the shop. 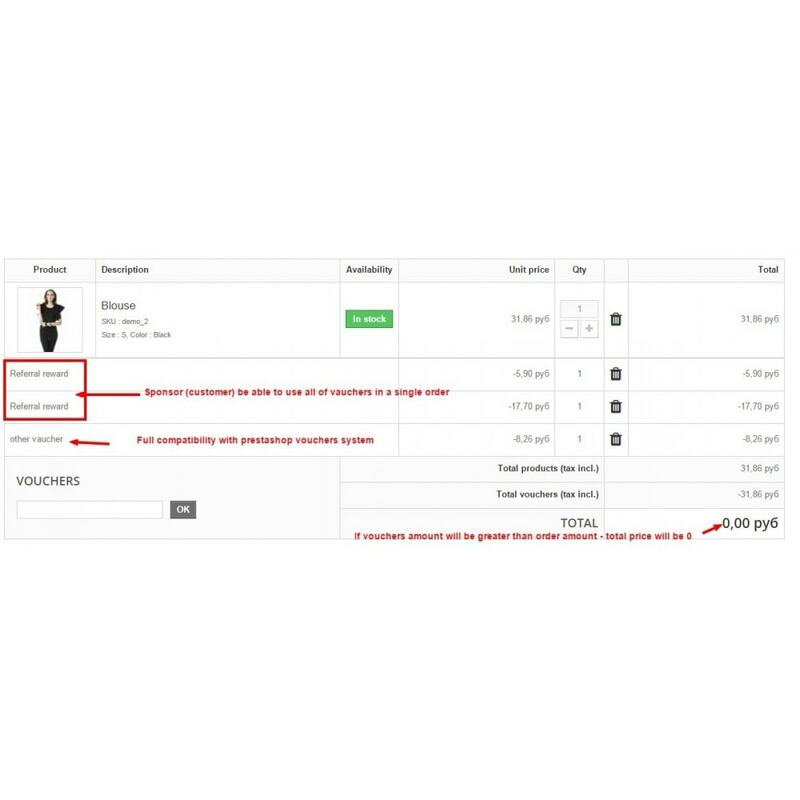 When a new user registers (with sponsor’s email or code) he will get a 10$ voucher (welcome coupon) valid 30 days. Then he make an order (order total is 100$). His sponsor will get a 15% from the current order total (it will be 15$) on sponsor’s next order. Sponsor can use these vouchers at any time. "What happens if a customer (sponsor) gets 3-4-5 vouchers for referrals? Will he be able to use all of them in a single order?" "What if vouchers amount will be greater than order amount?" Total price will be 0. 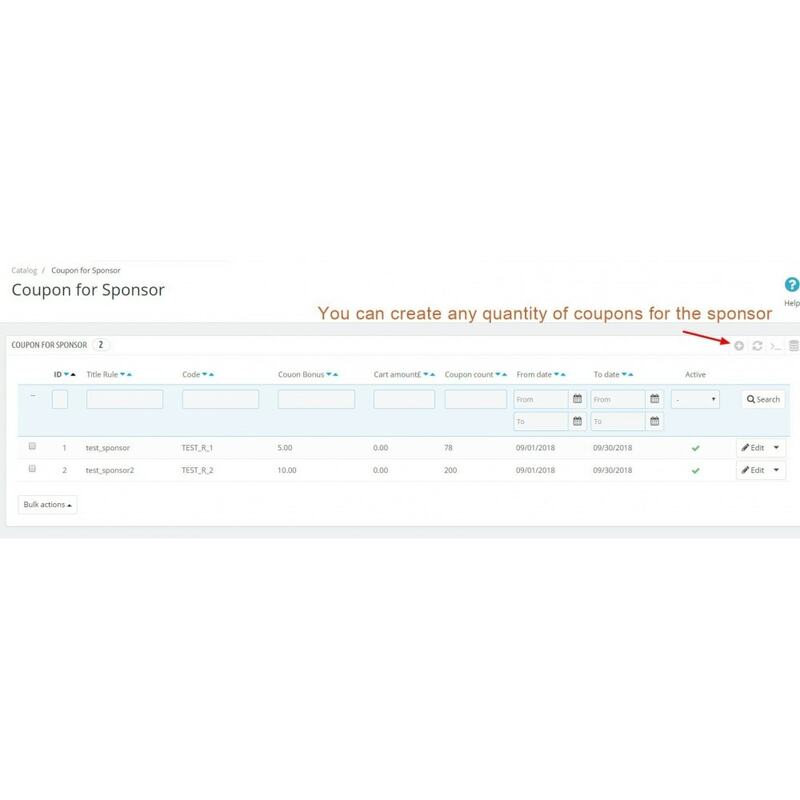 "Where can the sponsor find the voucher code for the referral?" 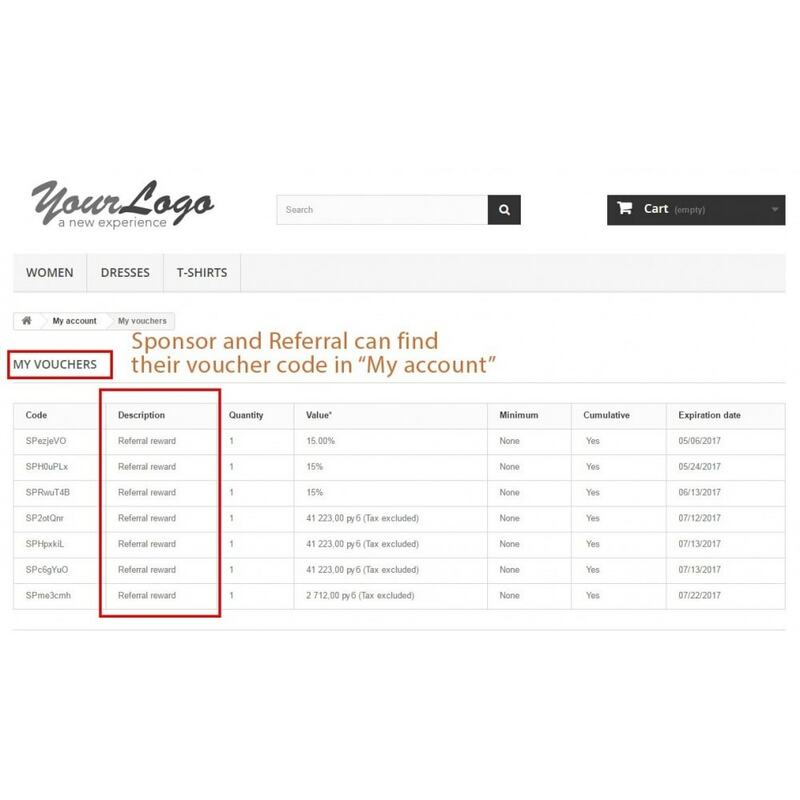 Sponsors can find their voucher code in “My account” – “My vouchers”.